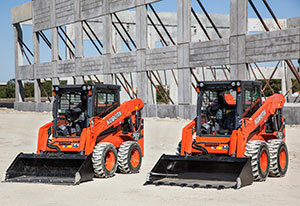 Kubota diversified its construction equipment line with the introduction of two skid-steer loaders, the SSV65 and SSV75. With standard two-speed travel and optional high-flow hydraulics, Kubota’s skid-steers meet the needs of construction, rental and agriculture customers. The rated operating capacity is 1,950 pounds and 2,690 pounds, respectively, for the SSV65 and SSV75. Both models feature a unique, slide-up, front-entry door that rises overhead, a side light for better visibility and safe night operation, and a spacious cabin with climate control. An optional multi-function lever is available, allowing for fingertip control of major machine and implement functions. 2 Comments on "Kubota: SSV-Series"